Okay ladies and lads...this is going to be a really fun week. The time I took off from the blog to recharge my creative juices helped immensely, and gave me extra time to devote to thrifting...and I mean hard-core thrifting. As a result, I have a ton of amazing items to share with you all, which I'm going to do over the next three days. For now, though, I wanted to introduce a new series that I'm really excited about: Vintage 101. This weekend I was dying to do some research on these gold metallic pheasants I picked up at two different places off the main highway in Oklahoma. One was from a tiny little roadside antique mall, and the other from a thrift store in one of the small towns. 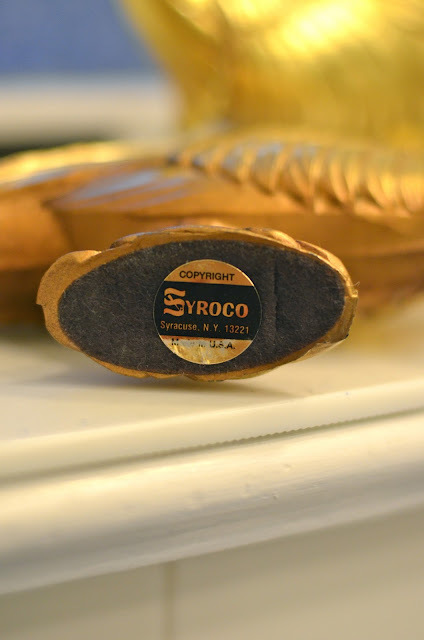 They're made by a company called Syroco, which, according to this source, stands for Syracuse Ornamental Company. It was started in the 1890s by a man named Adolph Holstein, who emigrated from Warsaw, Poland. He was a wood carver by trade and his company started out by making decorative wood pieces known for their ornamentation and details. Eventually, they figured out they could make stunning replicas by making a mold of the original wood piece, and this technique resulted in items made from what they called SyrocoWood. They looked like wood and had the same details, but were in fact made from wood pulp mixed with flour and other materials. According to this source, when the popularity of Danish Modern hit in the 1940s, the company added things like housewares, barware and items for smokers. 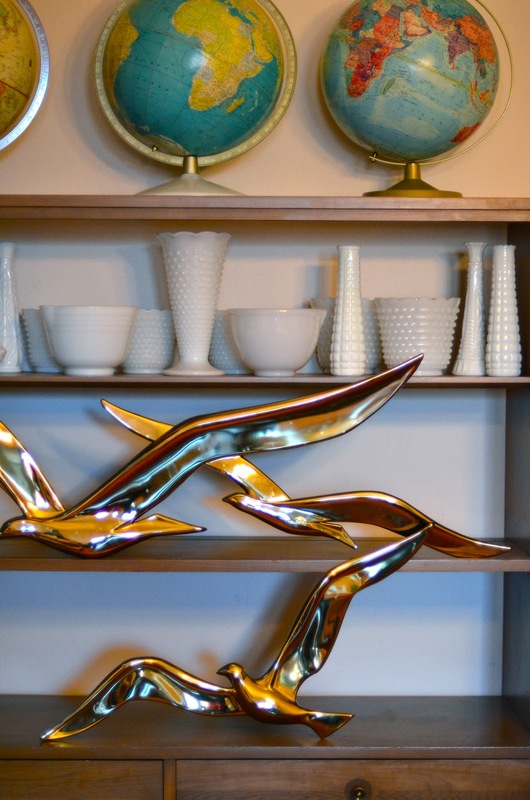 In the '50s, it started pumping highly stylized decorative items again, and developed a process called "metalgold," which, like the pheasants above, gave the item a gilded look. It's interesting to know all this, because these birds definitely have some weight to them, and at first hold I would think they were wood underneath that gold. But a steady knock on the side of the bird gives off a ring that definitely says it's made from some kind of resin. I searched "Syroco" on Etsy and Ebay as well, just to see what other items are resurfacing in today's marketplace, and I saw a couple of the pheasants I'd thrifted, but noticed they were missing something: another pheasant. It looks like these probably came with one that sits more vertical on a tree stump or something like that, so I'll definitely be keeping my eyes peeled for their mates. I also saw a different set of gold birds that looked just like ones I had thrifted about a month ago. And when I looked on the back, sure enough, they had Syroco printed on it. Be sure and check out those links above to read more about the company, and if you have an Syroco pieces in your home, I'd love to hear about them! Maybe you also have some tidbits about them you'd like to share? If so, please do! As a 'Central New Yorker' Syroco finds are a plenty around these parts!! Definitely an acquired taste ;-), but once you catch 'the bug' - WATCH OUT!! Ha! So true. I think my time in L.A. has me a bit predisposed to "Hollywood Glam" items, but I saw some other stuff by Syroco I wouldn't touch with a 10-foot pole. :) Thanks for your comment! Thanks for this post! I have a couple of these birds that I found at Value Village and ended up spray painting white. (Mine were a horrible plastic-looking copper before.) I've been wondering where they came from. Thanks again for the background info!